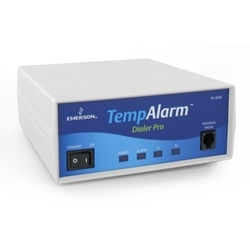 The new TempAlarm Dialer Pro (FA-900E) is the direct replacement for the Deluxe FreezeAlarm (FA-D2). As our most advanced FreezeAlarm, it offers the best protection for your home, cabin or business, plus a telephone thermostat control to remotely turn up the heat or air conditioning with a phone call! In addition to calling up to three phone numbers if the temperature gets too low, or the power goes out, the TempAlarm Dialer Pro can also call if the temperature gets too high, if you have a water leak or flood or if an intruder has entered the premises (optional sensors required and purchased separately). The Deluxe FreezeAlarm uses your existing telephone line to make outgoing alarm calls. You do not need an additional line, but you do need a regular telephone line. Most DSL, VOIP and digital phone systems work just fine, but testing with these systems is essential. The FreezeAlarm plugs into a regular 110 volt power outlet, but uses a 9 volt lithium or alkaline battery for back-up power. The 9 volt battery is not included. Lithium 9 volt batteries are highly recommended over alkaline batteries. They last longer in colder temperatures and hold their power much better when you have frequent power failures. Whether you need to control single or multiple zones, you can use the Deluxe FreezeAlarm’s phone controlled thermostat to turn on your heat or air conditioning before you get to your property. For multiple zones, you have two options, control all the zones or only critical zones, which is easier and generally more cost effective. Quick Status Check feature allows you to remotely monitor the current temperature, power and back-up battery status with a simple, 15 second phone call. Monitors both a high and low temperature set point at the same time making this model perfect for monitoring a deep freezer, walk-in cooler, floral cooler, green house or garage. Phone controlled thermostat to pre-heat or cool your home, cottage or cabin with a phone call. Add our WaterSiren (WS-04) water alarm to be alerted by phone of water leaks or flooding. Add a motion sensor such as the Risco wired motion sensor, or the Dakota Alert Motion Alert to be alerted if intruders have broken into your monitored property. Back-up battery keeps the unit operating even during a power failure. Unit can call out for up to 18 hours on a fresh 9 volt battery provided you have telephone service during a power failure. Power Out Timer allows you to select the amount of time the power must be out before it calls you with a power failure alarm. This helps prevent unwanted alarm calls during short power failures. Wide Temperature Range allows remote temperature monitoring from -50 to 300F (-55 to 150C). Remotely change any of the programming options, remotely cancel the alarm call-out and remotely check status via our Quick Status CheckTM feature. No monitoring fees or installation costs (although an HVAC or electrician contractor is recommended if you are installing this to interface with your heating and/or air conditioning system).